We feel like Christmas has come early this year with a few of our favorite designers shipping out our orders a little earlier than normal! We're thrilled to share a few gowns that have already arrived and some trendy numbers that will be here SOON! Stella has wowed us with her detailing this coming year, it has really gone above and beyond! The dress above not only has the clear sequin underlay to give supreme shine but banded straps that are trimmed with pearls. There wasn't a single Justin gown that din't make a statement but this detachable train took statement to the next level. We knew we had to have it when we laid eyes on it, which was a similar situation we had when looking at each gown! Justin's newest collection is full of all the hottest trends for the upcoming year! We are so thrilled to have this millennial blue gown in the store, we've had tones of blue before but this Justin takes the cake with its elegance. Martina showcased some brilliant backs in her latest collection. We added some great V-backs to our own collection from the whole Essense design house! We cannot wait to get them in! Many of our Hayley Paige picks were nothing like our last Hayley Paige buy. Some of these 2018 gowns will be replacing older styles in our store that have a special place in our hearts, for example the Londyn gown and River gown. We hope you are just as eager as we are to get these stunning gowns in! We look forward to seeing you shine in them #FutureBellaBride ! LAST WEEKEND CHICAGO BRIDAL MARKET TOOK US BY STORM WITH WINDS OF FRESH DESIGN, LIVELY COLORS, LASER-CUT LACE, AND LOTS OF BLING! WE SIMPLY CANNOT WAIT FOR THE ARRIVAL OF THESE GOWNS AND EVEN A NEW DESIGNER! MUCH EXCITEMENT FOLLOWED MARKET FOR NOT ONLY OUR STORE BUT FOR A FEW DESIGNERS WE CARRY! A huge build-up of anticipation for Kitty Chen’s newest collection for 2017 was formed at the show! Our newest exclusive designer never shy’s away from dramatic beading and patterns which we love, of course! The 2017 collection’s are no exception to the drama, we are honored to have a few pieces show up to our Kitty Chen trunk show this October! Following Chicago Market the DEBI awards took place to honor the best of the best in Bridal design and manufacturing. We’d like to congratulate A our divine vendors for taking home awards! We can’t wait to share more of Bella’s Buy with you all! Many Bella's come to us looking to find a dress that will be timeless. They try on a mix of styles and run into problems when they start to love a modern style or even small feature of the dress. Worries arise on whether or not 5-10 years down the road that the dress in question will be timeless or just a fad that came and went. Bridal Fashion Week affirmed the presence of a few trends we seem to get questions on. These trends are going to stick around and be seen all over Pinterest for a few more years! Lets break them down! 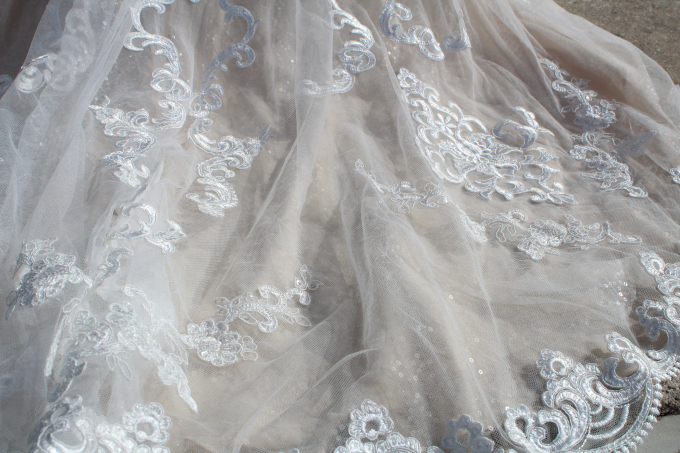 Visibly seeing a corset top throws many brides off, its a bold move that will be carrying on through out next year. If a bride isn't typically used to seeing herself in sexier clothing wearing a wedding gown that has the underwear element to it can feel as exposed as Vera Wang's take on the trend for Spring 2017 (seen below). To some the thought of wearing a risque dress around family members could give someone a heart attack, having the dress lined in its more sheer panels can help relieve the situation. The statement bow is easy to accept for playful brides who dress very youthful but for those on a more serious side it is harder to love. Size is always an issue, in many cases we see the bride wanting a smaller sized bow or no bow at all. Its definitely a matter of personality and taste. One thing is certain that bows, flowers, and bling will not be leaving the scene as a means of giving life to wedding gowns. Different tones of ivory, blush, and champagne are common to see for dress lining colors but Spring 17' brings a twist to color in the wedding industry. 'Something blue' can now be your entire dress not just a patch sewn in the inside of a gown or sticker on the bottom of a pair of heels. Black bridesmaids dresses are thrown to the curb and replaced with black wedding gowns for the not-so-traditional bride. Bling will not be leaving us anytime soon, year by year the intricacy of the embellishments becomes more apparent and eye-catching. It makes sense figuring the way designers want to out-do a previous design and keep innovating. As women we want the same, we don't want the same look as our friends or even third-cousin removed's wedding gown. Bling and lace allow for differentiation. Lace isn't questioned like all the shine and shimmer is because we tend to think we are over-doing it. NEWS FLASH: It's your wedding day, go all out bling it on its not going out of style! Striped gowns and horsehair trim will be making another huge splash for the seasons to come. Much like bling different patterns and textures are hesitated against because we are unsure if we are over-doing it. Patterns can confuse us because we are used to seeing them on casual wear more so than a wedding gown. Until you try these bold gowns on you will never know how it will look on you!